Welcome to the perfect venue for your special day! Mornington Golf Club is the hidden jewel of the Mornington Peninsula. 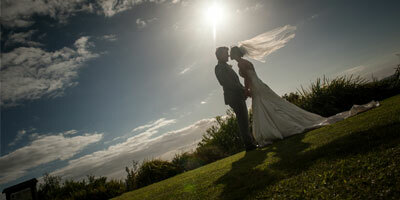 With freshly refurbished function rooms, stunning Bay views and a team ready to create a day to remember, you will find Mornington Golf Club is the most perfect of wedding locations on the Mornington Peninsula. Whether it is a casual gathering or a formal affair, we specialise in creating the perfect ambiance for up to 180 of your guests. Our two function rooms have their own distinct style, each with a balcony and glittering views of the Bay through floor-to-ceiling windows. The Club is set in manicured gardens high on the cliff top, making the most of naturally stunning photo opportunities in every direction. Invite your family and friends to witness the exchanging of your vows in our sunken garden, enclosed in lush greenery. Picture sweeping views over our greens, Port Phillip Bay and the Melbourne skyline as you are personally escorted around the club in your very own golf buggy. Please contact our Hospitality Manager, Rhonda Vincent on (03) 5975 2784 or email rhondav@morningtongolf.com.au for more information or to make a time to view our facilities.